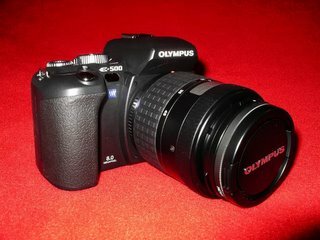 After a few months of contemplation, we finally bought a spanking new digital SLR, the Olympus E500. Why this model? Don't ask me, I'm not the technical one who will go to the net and compare features and prices. Daddy decided on the model. We have been using our Pentax Optio 555 since Nov 2003. It has seen us through a few holidays, Zara's birth, and her 1st year. I have been complaining about the shutter lag of the camera (which is about 1.35sec, very slow for precious moments). Every time when I tried to take a happy shot of Zara, after her smile has disappeared, then only the shot is taken. I had lost a lot of beautiful moments. Daddy wanted us to upgrade to another camera with improved speed. I wasn't keen. What's the point of owning 2 very similar cameras? I told him only if it's an SLR, or else, we just stick to what we have now. After much research and price comparison, we finally settled for this. The draw backs of these SLR cameras are that they can't take Videos and they are too bulky to carry around daily (which I do with my Pentax). So I'll still rely on my Pentax for day to day shots and videos. I don't know much about cameras or photography, I only know how to capture moments. I believe by owning this new toy, I will have to start learning. Daddy gave me 3 days to learn up (the use of the camera), so that I can use this new beauty to capture Zara's first birthday celebration on Sunday. Well, Zara was running a temperature yesterday, so I was very busy caring for her. Today, she seemed to have recovered (Dr can't tell why she got a fever, since she didn't have any infection or flu). If she remained alright (crossing my finger, for her sake as well as mine), I'll have today and tomorrow to learn up the features of the camera in preparation for her Sunday's party. If for me, bulky camera means less pictures will be taken! :P I am too lazy to carry around the gadget to everywhere. Have you tried taking pics with the camera already??? I missed my SLR Eos Canon camera (not digital). I lost my camera and had been hoping for a DSLR camera. I was itching for the Canon DSLR camera that can use my EOS lenses. Unfortunately, $$$ dun want to come. u better don learn to use this camera lah...let ur hubby use it on Zara's party lah..u gotta be model on tat day too mah..how could be camerawomen ler..hehe..
is zara teething? and cun new camera ah. i hate shutter lag too. annoying lah, by the time mine focuses, Gordon's disappeared ledi, lol. But my ricoh's pic quality's good. frankly, me dont fancy slrs becoz of its bulk and weight. got one canon eos under the bed, and i think that's be it's tomb. i want a new slim digital camera with all the features of a dslr thrown in, dont mind paying coz i'd be carrying it around a lot. you are absolutely right with on both accounts, it's the same here. But I'll definitely have to learn how to use it. Her birthday photos are taken by the SLR, but I'd shrunk it from 8Mb file to ~100Kb file, so the quality also deteriorate. why Olympus? I also don't know, hubby decides. always also sek ji kei one. must get fatty hold the camera and take photos already. Or else, next time SQ go through her old photos, cannot spot mummy one. the photos already up (her birthday post).. but still not used to using it yet, some shots not really that nice. it's one of the cheaper range. there are those with 5-figure price, which is out of our league. yup, you are right. So day to day, I'll carry the portable one around. Getting better already. I think she will miss Sam since she's been staying at home.